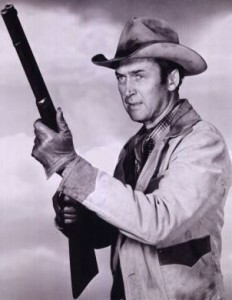 The Six Shooter brought James Stewart to the NBC microphone on September 20, 1953, in a fine series of folksy Western adventures. Stewart was never better on the air than in this drama of Britt Ponset, frontier drifter created by Frank Burt. The epigraph set it up nicely: "The man in the saddle is angular and long-legged: his skin is sun dyed brown. The gun in his holster is gray steel and rainbow mother-of-pearl. People call them both The Six Shooter." Ponset was a wanderer, an easy-going gentleman and -- when he had to be -- a gunfighter. Stewart was right in character as the slow-talking maverick who usually blundered into other people's troubles and sometimes shot his way out. His experiences were broad, but The Six Shooter leaned more to comedy than other shows of its kind. Ponset took time out to play Hamlet with a crude road company. He ran for mayor and sheriff of the same town at the same time. He became involved in a delightful Western version of Cinderella, complete with grouchy stepmother, ugly sisters, and a shoe that didn't fit. And at Christmas he told a young runaway the story of A Christmas Carol, Substituting the original Dickens characters with Western heavies. Britt even had time to fall in love, but it was the age-old story of people from different worlds, and the romance was foredoomed despite their valiant efforts to save it. So we got a cowboy-into-the-sunset ending for this series, truly one of the bright spots of radio. Unfortunately, it came too late, and lasted only one season. It was a transcribed show, sustained by NBC and directed by Jack Johnstone. Basil Adlam provided the music and Frank Burt wrote the scripts. Hal Gibney announced.